Our Partners, Daniel, Lily and Lionel completed their Andhra Pradesh State Missionary Convention. Daniel says "It was awesome. Fourty missionaries and 160 delegates attended. We had 15 baptisms from the near by village. Altogther we had 356 baptisms in this year in Andhra Pradesh alone. We were able to bless 25 missionaries with new bicycles and their wives with new dresses. We are planning to take 10 more missionaries for 2008 and open 2 more Mercy Homes." The photo shows the very blessed and happy missionaries. Daniel and Lily began their ministry, named Voice of Gospel in 1975. They have trained hundreds of missionaries and planted over 700 fellowships in seven states in India. 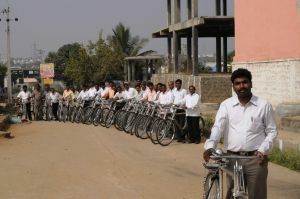 What an exciting report--to read about the bicycles and dresses given to 25 missionaries and spouses! Great job, Daniel, Lily and Lionel! !